I’ve been a fan of science fiction for a couple of years, and when and how that came about I couldn’t say; but the fantasy aspect combined with that bit of reality has always appealed to me. When it comes to science fiction, those two things are really the only way to pinpoint what is science fiction and what’s not. Most people would consider any story with a spaceship in it science fiction, but according to science fiction writers like Ray Bradbury, even that’s not enough. Isaac Asimov is a name that anyone familiar with science fiction would probably know; the chances are slim that a science fiction story written now, be it book or movie, could cover an idea Asimov left unexplored in his literally hundreds of books. He once had an argument with one of his editors over what the nature of science fiction was, and the said editor insisted that it was a genre: that there was a particular type of story along with certain elements, just like any other genre like romance or thrillers. Asimov disagreed, saying it was nothing more than a setting and could easily be mixed with any existing genre; so one could actually have a “romance science fiction”, or even a “thriller science fiction”, or any other genre combination they could think of. The editor replied that there could be no such thing as a “mystery science fiction”, since mystery by its nature depends on the reader already knowing particular facts about the world and science fiction itself is mostly world building. 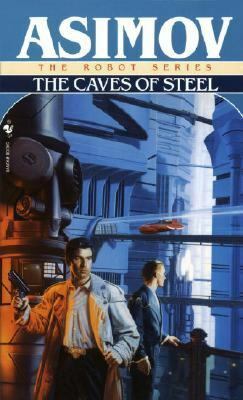 Asimov responded by writing The Caves of Steel, a simple murder mystery about a detective in New York. The detective is named Elijah Bailey, and like any good citizen of Earth he harbors a hatred for highly capable, intelligent robots. In Elijah’s time, it’s been centuries since intergalactic travel became a reality, and with that the development of new societies. While technological advances on Earth began to slow down to a stop, the “Spacers”, as the people who lived on these other planets were nicknamed, raced ahead and designed what the people of Earth could only dream of. When some of these Spacer technologies, like intelligent robots, found their way into Earth society, the result was perfectly good workers, such as Elijah’s father, losing their jobs to computers. Yet, despite the potential ill-will, the Spacers are determined to keep up good relations with Earth and have a settlement right outside of New York City for that very reason. They even seem to be successful, until the day that one of their robotic engineers turns up murdered; and all evidence points to an Earthman as the murderer. Being a just above average detective, Elijah is lucky to get such a high-profile case, and there’s plenty of benefits to be earned if he handles this case well; but there’s a catch. Because it was a Spacer that was killed, the other Spacers insist that Elijah has to take one of their robots as a partner. Even as Elijah reluctantly agrees, one of his worst nightmares seem to come true when he’s introduced to his new “partner”, R. (Robot) Daneel Olivaw; the robot looks just like a human. The interactions between detective and “partner” throughout the story end up as an ingenious springboard for introducing the story’s theme: if it was possible for us to make a robot as intelligent as R. Daneel, what would the difference be between it and a human being? Asimov is a “show” rather than a “tell” author when it comes to ideas, and so instead of a scene where Elijah and Daneel sit down to have a point by point debate, we simply watch the issue unfold as Elijah’s hatred and fear of robots blossoms into personal insecurities as he works with Daneel. Elijah prides himself on his agility after doing a physically demanding stunt; only watch Daneel do it with ten times the grace and ease. He rakes his mind to try and remember a single name, while Daneel casually picks out one face from millions. When humans are placed in comparison to robots, it’s basic common sense that humans are inevitably going to lose. Our biological bodies are unreliable; they can be weak, they can, and will, grow old, they require food and water, and they can even become permanently paralyzed. Our minds are no better, clouded by emotion and reflecting whatever state the rest of our body is in. The Caves of Steel was written close to sixty years ago, and there’s something a little frightening about how much the story continues to become more relevant. When Asimov wrote it, the world had just watched the Nazis dispose of human beings as if they were just by-products only a decade before. Today, our own culture treats humans as nothing more than the sum of their parts; if a child has Down Syndrome, we abort them, or if the elderly can no longer care for themselves, we euthanize them. In fact, it’s interesting to wonder if Elijah would have come to any conclusion about the value of human life if The Caves of Steel had been written in the 2010’s instead of the 50’s. Though Asimov was an atheist, he still understood what makes us significant. Human beings are the only creatures in the world who have free will, the ability to change. We can be the arbiters of justice, and at the same time somehow understand what it is to be merciful. We can be victims, and still be forgiving and compassionate. Above all, though, humans are the only creatures, or in the case of robots, things, capable of knowingly choosing evil, and having the chance to be redeemed.